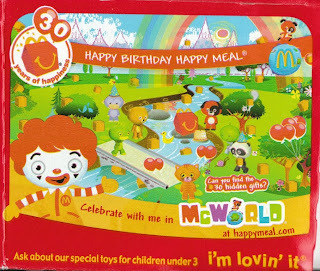 Here's part of a recent Happy Meal box, where little Ronald is asking you to celebrate with him in his McWorld. To me, that has a kind of "come stay with me at Neverland" feel to it. Even more depressing is the fact that on the box they're touting 30 years of "happiness." I'm sure that childhood obesity and poor nutrition are something to celebrate. But the coup de grâce on the box is little Ronald himself. 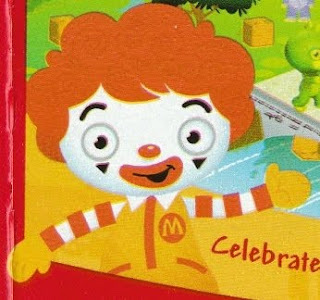 I've seen many disturbing incarnations of the hamburger clown, but there's something about this one that sends chills up my spine.